As many of us already know, this winter has been a rather snowy one across the Northern Plains. Given the flood history across the Red River Valley I thought it would be interesting to see where we are currently regarding snow water equivalent (SWE) and compare that to other years when the Red River Valley experienced significant flooding. I have listed below some images I found at the National Operational Hydrologic Remote Sensing Center (NOHRSC). The first image is the current SWE as of January 11th, followed by comparisons of what the SWE was at the same time for 1) Years data was available and 2) Top 10 flood crests at the Grand Forks gauge. As you can see, we’re already ahead of previous years in snow water equivalent. Does this mean record flooding come spring? Not exactly. There are plenty of other factors that go into spring flooding including rate of snow melt, soil moisture content in the fall, etc. This post isn’t meant to be a flood predictor at all, just a look at snow water equivalent (which ultimately factors in to flood potential). I also found it interesting to see where the highest SWE was found in relation to drainage basins. 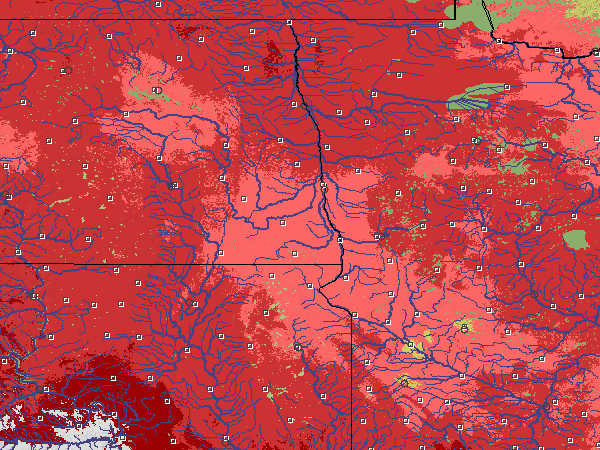 The image below shows high SWE levels lining up along some major rivers and their tributaries. High SWE along the southern Red River Valley and Minnesota River. As stated earlier, this isn’t necessarily indicative of spring flooding potential as there are numerous factors involved that are beyond the scope of this little blog post. Grand Forks Weather Buffer Blocks Heavy Snow.